Time is an entity embedded into the very fabric of Chennai’s being. A flick of the wrist or the swish of a mobile phone is all it takes to tell time in 21st century Chennai. But there existed a time when the people of Chennai, nay, Madras had to rely on the clocks atop some of Chennai’s famous landmarks to tell the time. The city’s connection with clocks and time keepers goes back to 1849 with the founding of P Orr and Sons, the city’s oldest watchmakers. But another, a more deeper connection the city has is Gani and Sons, the team behind many of the clock towers dotting the city today. Initially known as the South India Watch Company, Gani and Sons was started in 1909 by Haji Mirza Abdul Gani Namazi, whose family had come to Madras from Iran. Specialists in big clocks, Gani and Sons have provided clocks for the independent clock towers of Royapettah, Mint, Choolai and Tiruvottiyur among others. They have also provided clocks for Anna University, Sterling Towers and Spencer’s Plaza, to name a few others. MMJ Namazi, grandson of Haji Namazi, remembers the clock towers very well. “Some of these old clock towers were built in the 1950s. “I seem to recollect that we built a spree of clock towers across the city during that time,” he says. Till date, Gani and Sons have built more than 70 independent towers and clocks for buildings, says Namazi. But now they maintain only the clock at Sterling Towers. “The rest are maintained either by the corporation or by other clock-makers in the city. Some have fallen into disrepair too,” he says. 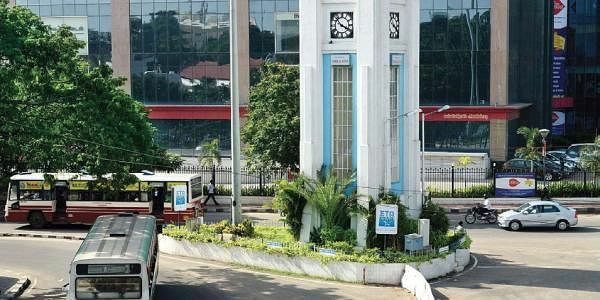 The Royapettah tower is maintained by P Orr and Sons, along with maintaining their own iconic 150-year-old clock mounted on top of their headquarters on Mount Road. Once connected to the Madras observatory, the clock remains in perfect working condition even today. Apart from designing these huge clocks, the main challenge with clock towers seems to be the installation. “The Spencer’s clock installed in 1998, was the one which gave me the most trouble,” recalls the veteran in the business. “It weighed almost a ton. The task of carrying it up in the middle of the night and then holding it up till we punched a sizeable hole was a complete nightmare,” Namazi remembers.